Mmm! There’s nothing like the smell of baking bread. In fact, that was my favorite part of my drive home from work in Baltimore. H&S Bakery in Fells Point bakes bread about 24 hours / 7 days a week. The delicious smell wafting in your car windows was well worth the traffic. Almost. Anyway, I wanted to make my husband a truly delicious lunch. He travels so much for work he deserves a phenomenal home-cooked meal! I love Italian food (and I LOVE watching Giada De Laurentiis). I’ve been craving some good Italian bread recently. Low and behold, we were all out of sliced bread at home (yes!) so I had an excuse to make ciabatta bread. I love that it’s crunchy on the outside, yet flaky on the inside. It holds a sandwich (panini) really well without the crust being too hard. Needless to say, I decided to make homemade ciabatta bread! 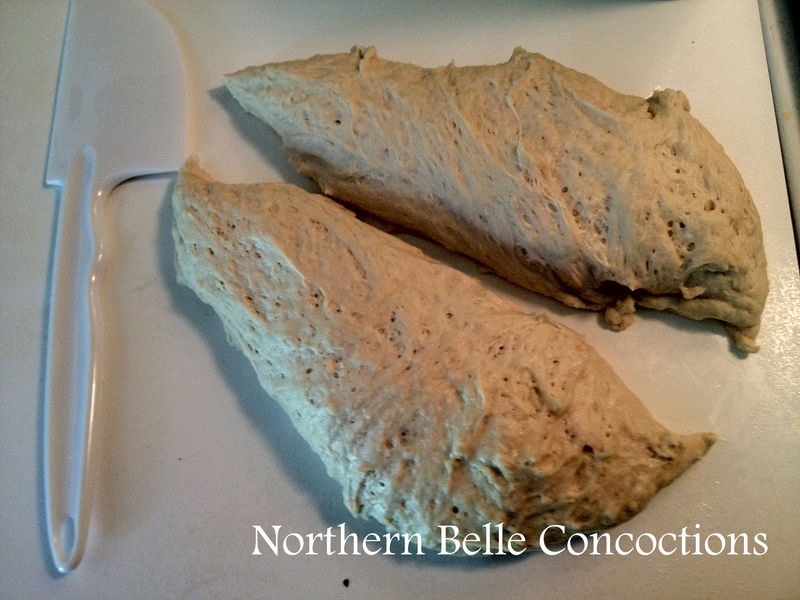 I have never made bread before, nor do I have a bread maker much less the “paddle” attachment for my hand mixer that bakers use for bread batter. 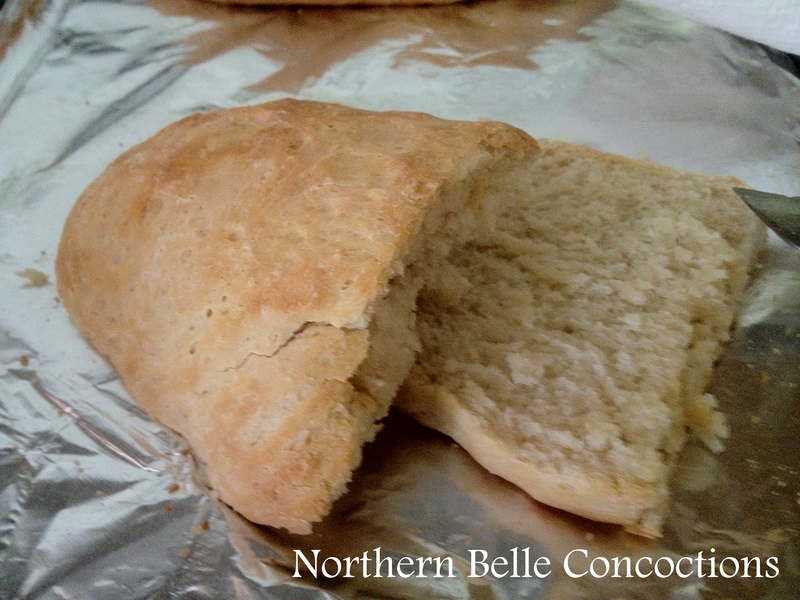 Once you make this bread you won’t want to buy sliced bread. Ever! Since this was my first time making break, I scoured the internet for tutorials and found this one on Pinterest. 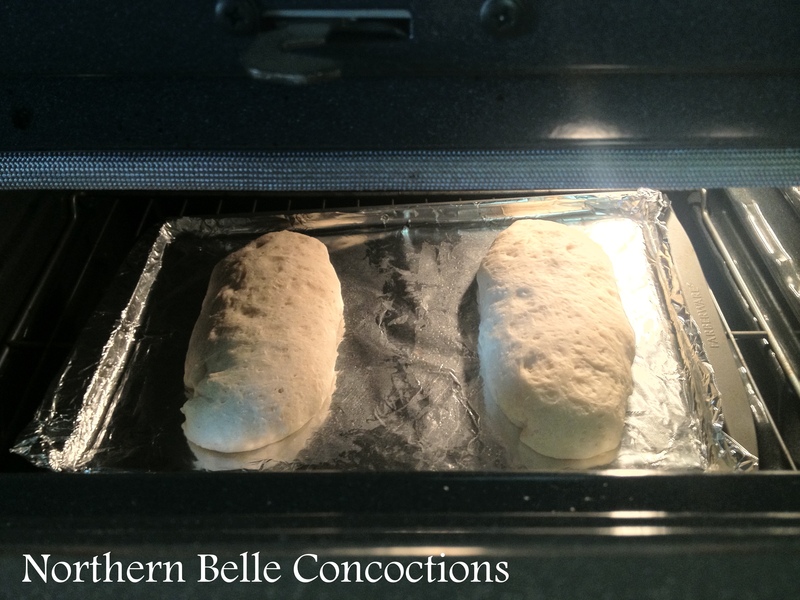 I like that they had pictures showing you what the dough would look like before and after rising. I couldn’t capture ALL of the steps on my iPhone for this project, but I will give you as many details as possible. Where I don’t have pictures, I’ll include pictures from Mel’s Kitchen Cafe. This recipe calls for a “starter” the night before. 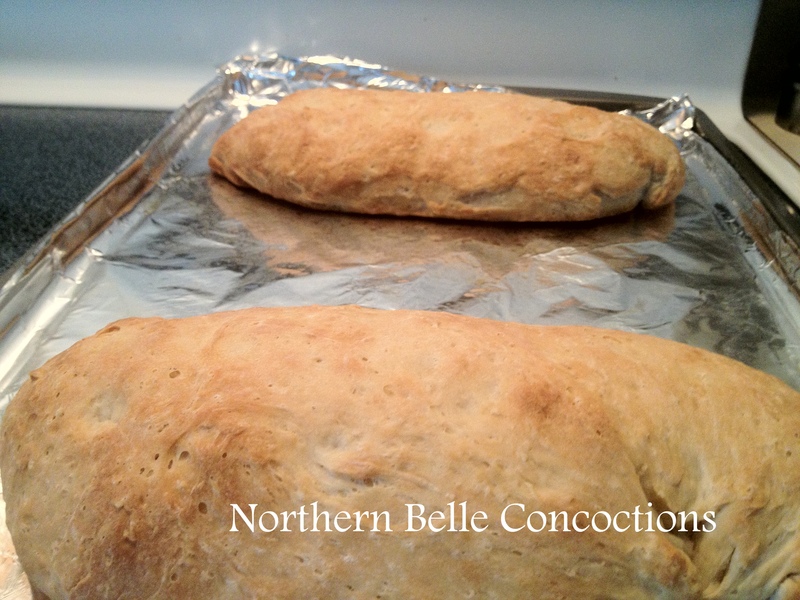 It’s a yeast and flour dough base to give the bread good flavor and consistency. DON’T skimp out on it! I thought it would be harder but it wasn’t. Also, this was my first time using yeast and I had no idea there were SO many different formulations of yeast! Mix the starter ingredients in a small bowl until well combined. 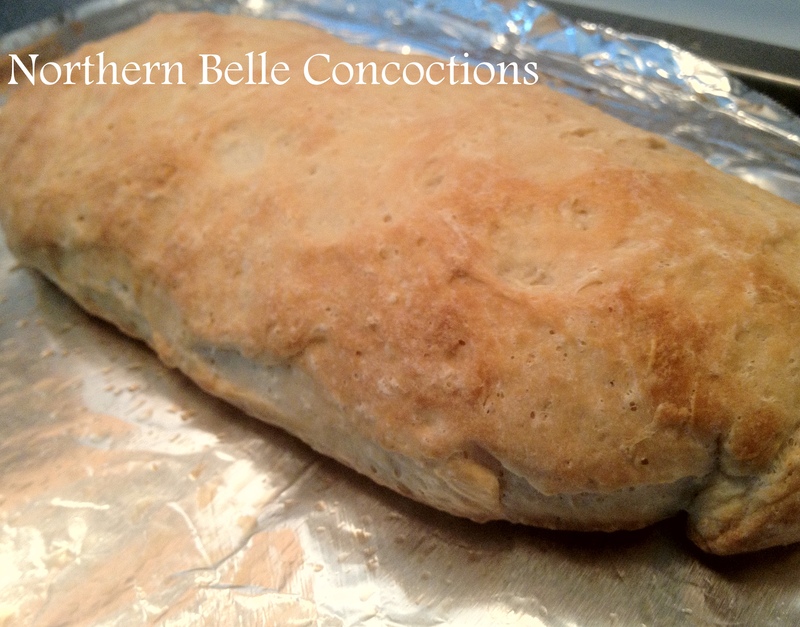 Cover the starter and let it rest at room temperature overnight. A little lumpy-looking, but it did grow a tad overnight. I didn’t have a 1/16 tsp measuring spoon, but since I’m awesome in eyeballing a quarter of anything, I’m sure I measured a quarter of a 1/4 tsp correctly. (After all, teaching quarter-, eighth-, and sixteenth-note rhythm values in your music classes makes you a pro at this). Here’s what I learned: I could have used a little more instant yeast. 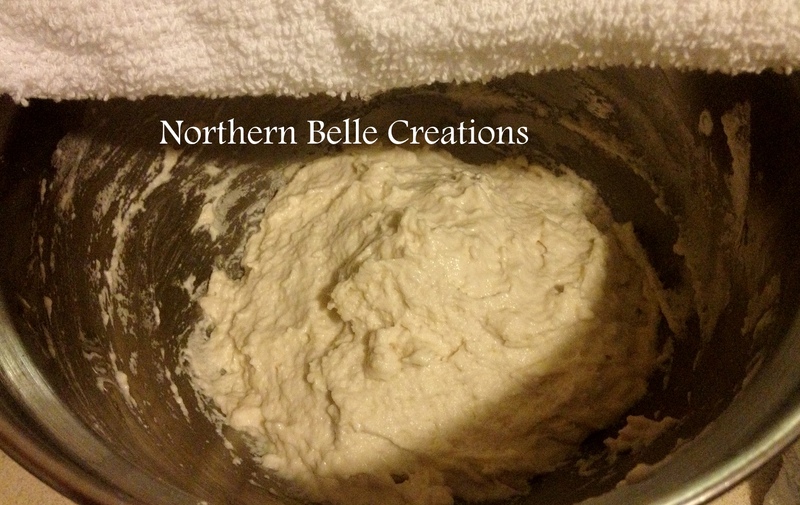 I was not too impressed with how much my dough rose overnight, only because it didn’t look as bubbly as my source. But I must have done something right because it turned out delish! I used Fleischmann’s RapidRise highly active yeast. (Their website says it is the same thing as instant yeast and bread machine yeast. Insert confusion and frustration here!) I did mine exactly as instructed. However, since elevation and humidity make a HUGE difference in rise, my finished product this morning was not as bubbly as Mel said it should be. I then (just to rule out an error) made a SECOND batch of “starter” with 1/8 tsp yeast and lukewarm water instead of cold water (per the yeast envelope’s instructions). Yeah, that was pretty much a waste of flour because it didn’t do anything. So used the original starter I made hoping for the best. Place all of the dough ingredients, including the starter, into a bowl and mix thoroughly until the dough is smooth but tacky. I do not have a flat/paddle beater for my hand mixer, so I did this with a whisk, a spoon, and some some elbow grease. The dough was very wet and sticky in the beginning. 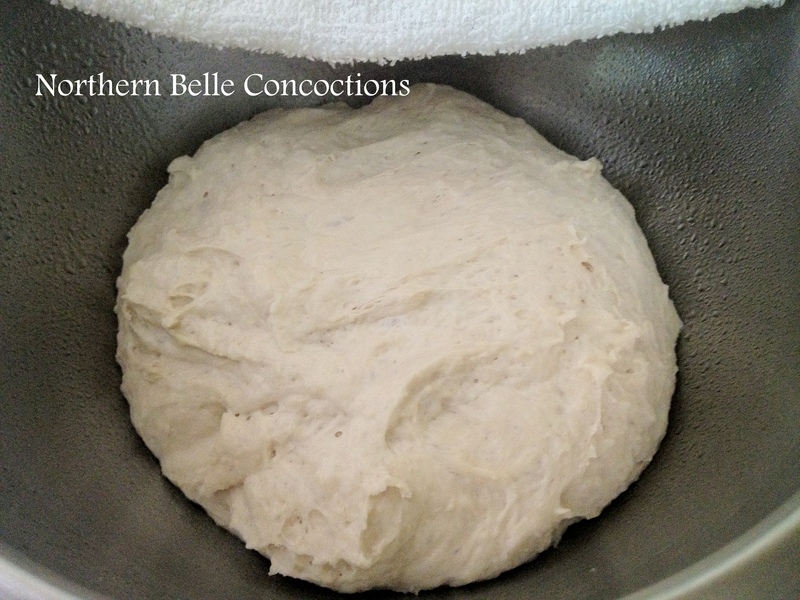 After mixing for 7 – 10 minutes, the dough was soft to the touch, and elastic. Mine was also a little bumpy, but what I DIDN’T expect was just HOW STICKY this dough was! My goodness! It clung to my fingers like it was its business! Using canola oil spray, oil your hands, and transfer the dough to a greased bowl, cover, and let it rise for 2 hours, deflate it halfway through, and letting it rise another hour. This is where covering with a very damp towel helped me. About an hour after loosely laying a dry towel over the bowl, nothing had risen. The hubs suggested the damp towel and it worked! look at the condensed water from the towel! Lightly grease your work surface/counter, and a half-sheet baking pan (18″ x 13″) or similar large baking sheet (I put aluminum foil on my pan so I wouldn’t have to clean it!). Grease your hands, as well. Very gently turn the dough out of the bowl onto your work surface with care that you don’t deflate it. 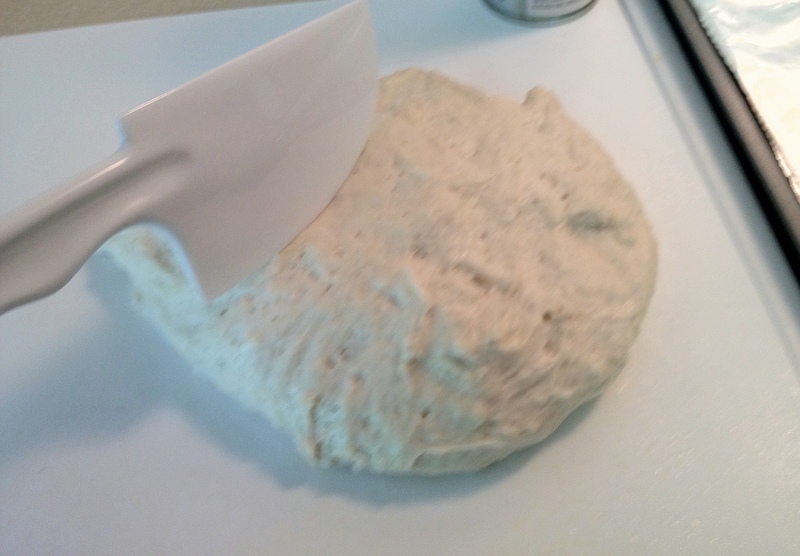 Using a bowl scraper, knife, or your fingers, divide the dough in half. You should have two logs, each about 10″ long x 4″ wide. 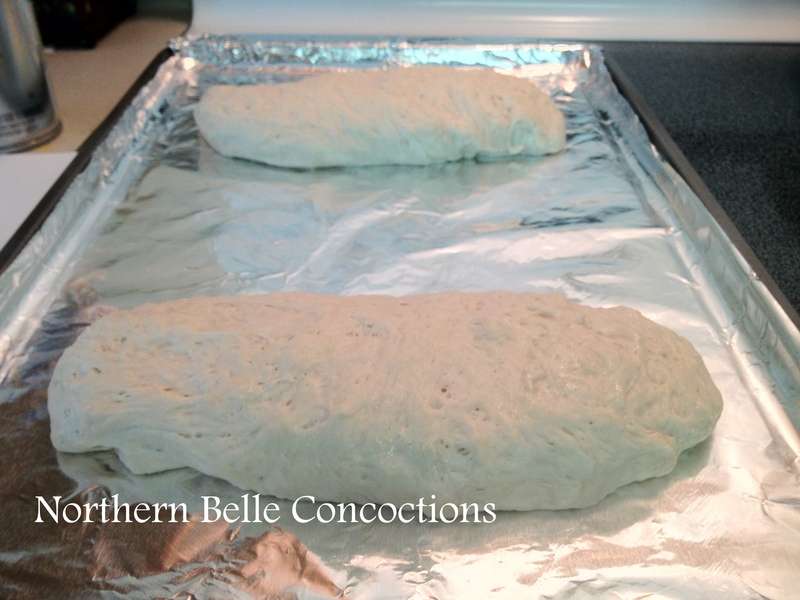 Handling the dough gently, transfer each piece to the baking sheet, laying them down crosswise on the sheet. Position them about 2 1/2″ from the edge of the pan, leaving about 4″ between them. 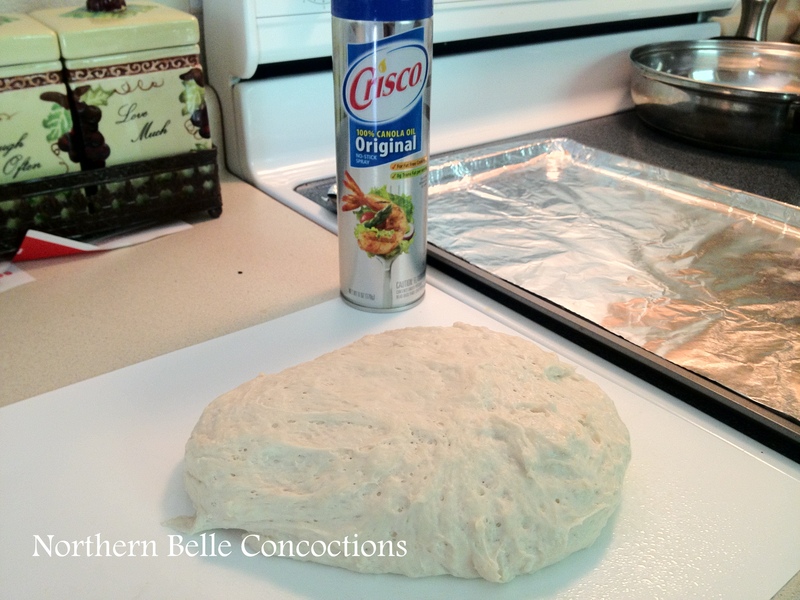 Lightly cover the dough with heavily oiled plastic wrap, and allow it to rise for 60 to 90 minutes. Midway through, gently but firmly dimple the dough with your fingers, making fairly deep pockets. Towards the end of the rising time, preheat the oven to 425°F. This picture was taken after about one hour of rising. Notice how it has expanded from the above picture, before covering with oiled plastic wrap. 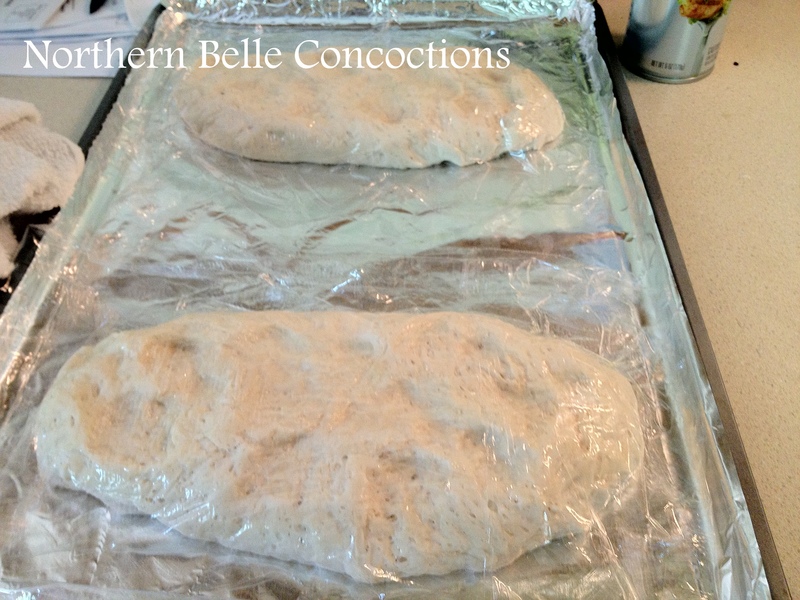 Spritz the risen loaves with lukewarm water. You’ll see that the dimples have filled in a little. Bake the loaves until they are golden brown, about 18 to 20 minutes. (I baked mine for about 25 minutes. Again, altitude and humidity change things a bit). I LOVE peeking at baked goods in the process of baking!